Xplosion T6 Fat Burner is a weight loss supplement manufactured in England by Epic Supplements and marketed under the Super Slim brand name. The company is based in Kent and claims to be one of the fastest growing names in the food supplement industry. According to the sales page on the Epic Supplements website, Xplosion T6 stimulates increased fat burning and attacks “the stubborn areas where unwanted weight sticks around”, but the company fails to provide any information about how this will be achieved. Looking at the formulation, it does not appear to contain any of the most talked about fat burners at all. There is no green tea or capsicum extract. Nor is there any green coffee bean extract. Caffeine is probably the best fat burner included and it has been around so long people lost interest in talking about it a long time ago. L-Tyrosine (200mg): An amino acid that is often added to bodybuilding supplements because it can assist protein synthesis and help encourage muscle growth. Caffeine (180mg): A very popular energy providing ingredient that is good for boosting mental alertness as well. Scientific research shows supplementation with caffeine can also boost the metabolism and trigger thermogenic fat burning. Grapefruit Extract (50mg): A bitter-tasting fruit that contains an enzyme, called AMP-activated protein kinase (AMPK), that may assist weight loss by helping the body to burn its stores of fat. L-Tryotophan (35mg): An ingredient that that is sometimes used as a treatment for insomnia but is unlikely to offer anything of value here. L-Taurine (25mg): An amino acid that may function as an antioxidant, but is more commonly used as an ingredient in energy drinks like Red Bull. Vitamin B6 (14mg): A vitamin that supports healthy metabolic function. How to Use Simply Slim Xplosion T6 Fat Burner – One capsule is needed every morning. A second capsule can be taken in the afternoon, but it’s optional. People who are planning a workout session should take one of the capsules 30 minutes before they start training. A number of Amazon customer reviews suggest the product may cause stomach pains and other side effects, so anyone considering using Xplosion T6 would be wise to obtain a doctor’s advice prior to doing so. A 30-capsule pack of Xplosion T6 costs £9.99 when purchased from the Epic Supplements online store. At the time of this review the Amazon price was £10.49. The Amazon sales page states the product is guaranteed. No indication is provided about the time period involved, but it seems likely that Amazon will insist the company plays fair by any customers who are not satisfied with the product’s performance. Customers who purchase from the manufacturers website may find it harder to pull their money back because the 30-day returns policy fails to state if the company accepts returns of products that have been opened and used. Simply Slim Xplosion T6 may support weight loss to some extent, and should boost energy levels as well because each pill contains as much caffeine as a couple of cups of coffee and also has some taurine. 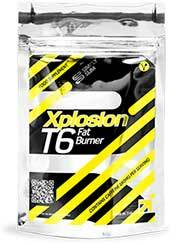 The pills are unlikely to be as strong as many competing products, but they are reasonably cheap so Xplosion T6 might be worth a shot if you are looking to do a little bargain basement blubber busting. As with anything in life though, you only get what you pay for. Anyone who truly wishes to maximise their weight loss and reach their goals would be much better off choosing an alternative product instead.